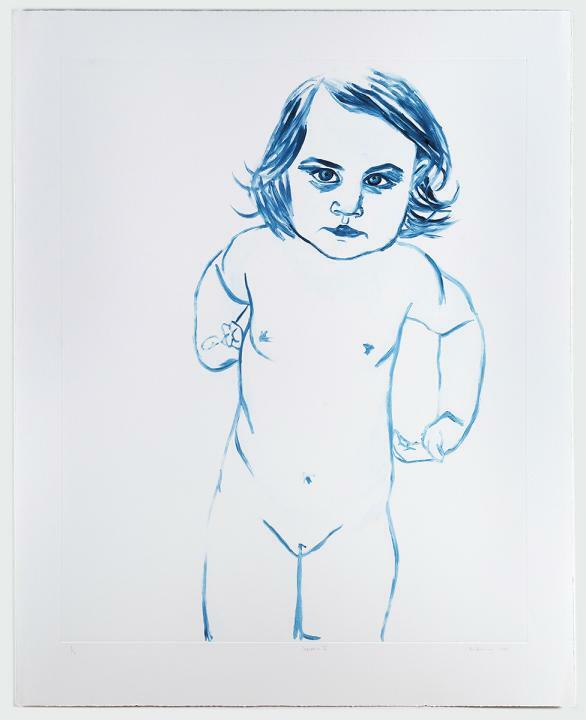 Executed on 29 and 30 September in London, the present work is unique and is from a series of 22 monotypes that make up the artists' first significant print project and relate to her Disguise series of paintings and drawings. Like most of her protagonists, the figures in Nicky Hoberman’s works come across with strong stances, holding their ground. They are outwardly tough, often staring at you with an air of defiance. Yet these young figures, most often girls, hide their inner sweetness behind this facade. The artist likes to play with titles and the present work is no different from any other. Cupcake III depicts a strong, tough little girl - her stance and body language in absolute contrast to the innocence of her youth. The title, Cupcake, is a double entrende; her “sweetness” belying the mask, literally and figuratively, of the strength of her face and posture. Add to this, the tension created by the young child’s nakedness which is, according to the artist, also a disguise (mask) and a means of hiding one’s inner self. Nicky Hoberman is not interested in likenesses and she is not a portraitist in the traditional sense. What appear as portraits are merely states of emotions or expressions and the artists’ way of defining the people, young or old, within her world.